At Haydens Gymnastics and Cheer Academy we believe that becoming a “Champion for Life” can start early. From Sensory Stimulation to gross motor development and cognitive learning skills, our classes use activities to stretch the body and mind. Students will progress through the system by age and the recommendation of their teacher. Our classes teach children to have fun with fitness and provide a stable foundation for their future. The teeter tot class is where crawlers and toddlers learn to climb, move, and explore in a safe environment with their favorite person close at hand. Different textures, colors, shapes, and spaces are incorporated to give your toddler cognitive stimuli while building strength, balance, and coordination using age appropriate equipment. The children will be able to socialize as they learn to play with one another. Classes begin with group stretches, followed by open play guided by the child's interests as they explore an obstacle course, various gymnastic equipment, and a tumble trampoline. Each class is 30 minutes. *All policies are viewable when you click the "Register" button. Children work on strength, flexibility, balance, body and air awareness, and spatial relations. 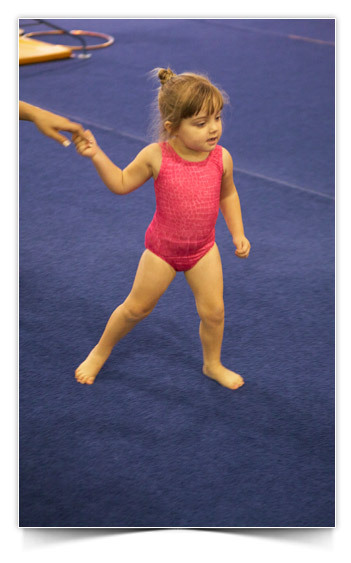 Children are taught basic gymnastic positions and terminology. In these classes we continue going through the movement on age-appropriate gymnastics equipment using circuit and obstacle training. Health and nutrition are incorporated as well as cognitive learning skills, spatial orientation and lateral movement. Most of all, these students develop a positive self-esteem while practicing developmentally appropriate gymnastics skills. Each class is 45 minutes. Must be potty trained. NOTE: When you child completes the Tumbling Tots class, or at age 5, they are eligible to enroll into our Beginner Gymnastics classes. See Girls or Boys recreational pages.